San Luis Obispo is a large and diverse county on the central California coast. It is traditionally considered the northernmost of "southern California" coastal counties, and it does have long stretches of sandy beaches which will recall Santa Barbara and Malibu. There is a large coastal estuary at Morro Bay, guarded by impressive Morro Rock, which hosts a huge wintering flock of Brant, as well as many waterbirds year-round. In contrast, the flat, dry, alkaline Carrizo Plain in the southeast has a unique ecosystem and is now a National Monument. Coastal ranges have extensive oak woodlands and chaparral, and there are many vagrant traps adjacent to coastal cities. Pelagic trips out of Avila Beach can garner a wide range of oceanic species. Bald Eagles have been re-established as breeders at Lake Nacimiento in the northwest corner of the county. County birding statistics and links are on Joe Morlan's site. Extensive information on birds and birding in the county is on Mike Stiles' county birding web site. 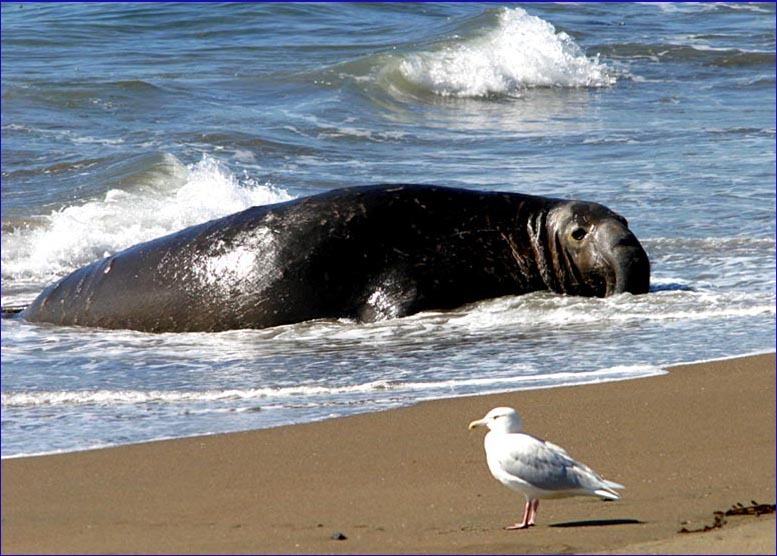 The photo chosen for San Luis Obispo County shows an adult Glaucous Gull standing on the sandy shore as a huge bull Elephant Seal lumbers ashore at its breeding site at Pt. Piedras Blancas. I just love these sort of dramatic comparison shot, and especially when it involves a bird and a mammal. What makes the photo even more special is that I personally discovered this adult Glaucous Gull, which is a rarity in California and especially so in southern California. Furthermore, adult Glaucous Gulls are exceptional anywhere in the State, and this was apparently the first ever of this age-class in this county. So not only did I enjoy setting up the dramatic photo by choosing a photo angle, but the shot documents an exceptional bird record. Below are a couple more closer photos of this rare gull, showing the bill-head structure and the clear yellow eye, and a stretching shot showing the tail and wings nicely. Note also the very short legs for such a large gull. These two scenics show something of the San Luis Obispo County coastline: the Pt. Piedras Blancas lighthouse with a portion of the Elephant Seal colony in foreground (19 Feb 2006), and a view of Morro Bay and Morro Rock (21 Jan 1997). On the other side of the county, the barren hills around the Carrizo Plain can come alive with incredible swathes of flowers after winter rains; the photo shown is from 12 May 1991.